At the time this article was written, Dr. Lauenstein was an Assistant Professor of Radiology, Department of Radiology, The Emory Clinic, Atlanta, GA. He is currently an Associate Professor of Radiology, University Hospital, Essen, Germany. Crohn's disease (CD) and ulcerative colitis (UC) are the 2 most common forms of chronic in-&#64258;ammatory bowel disease (IBD). While CD potentially affects the entire gastrointestinal (GI) tract, UC is limited to the large bowel and the terminal ileum. Overall, the terminal ileum and proximal colon are the parts of the intestine that are most often affected in patients with IBD. 1 Numerous techniques are used clinically to assessIBD, including ileocolonoscopy, ultrasound, capsule endoscopy, and/or surgical techniques in conjunction with tissue biopsy. 2-4 However, these techniques are either invasive (endoscopy), associated with low diagnostic accuracy (ultrasound), or are contraindicated in a considerable number of cases (capsule endoscopy). Other modalities, including conventional enteroclysis and computed tomography (CT), expose patients to ionizing radiation. 5 Although CT-based techniques provide promising diagnostic information in depicting in&#64258;ammatory bowel lesions, 6 the future of CT as an imaging method for IBD remains uncertain. The required use of ionizing radiation raises a health concern, since most patients with IBD are young and the examinations often need to be repeated several times for therapeutic monitoring purposes. 7,8 Even though low-dose CT protocols for the assessment of the bowel have been applied, 9 a modality without radiation exposure would be preferable if it provided similar diagnostic accuracy. 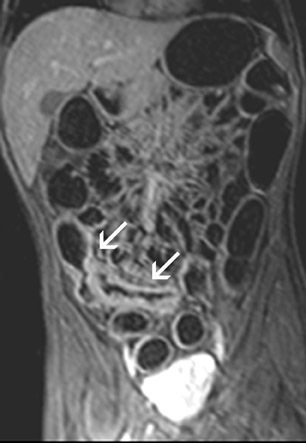 An appropriate degree of bowel distension is a prerequisite for adequate MRI studies of IBD. Most bowel loops are collapsed in their physiological state. Non-distended bowel segments may result in false-positive and false-negative findings since collapsed segments may mimic bowel wall thickening that can be misinterpreted as IBD. Furthermore, smaller areas of abnormality may be overlooked. Colonic distension can be easily accomplished by the administration of a rectal enema that includes liquid or gasiform contrast agents. 11 However, this issue is more complex for evaluation of the small bowel. Oral contrast agents can be administered via a nasoduodenal tube in a similar manner to that used for conventional enteroclysis. This technique allows for uniformly adequate bowel distension 12,13 (Figure 1). However, this procedure is often perceived as traumatizing by patients because of its invasive character. The oral administration of water without prior GI tract intubation is noninvasive and generally well accepted. However, water is rapidly reabsorbed in the small bowel, and only a moderate degree of bowel distensionis usually achieved. 14,15 Certain additives have been found to slow down intestinal reabsorption of water. Oral solutions containing substances such as mannitol, 16 sorbitol, 17 polyethylene glycol, 14 or ispaghula 18 have been used in this clinical setting. The oral administration of these solutions results in a consistently greater small bowel distension than does the use of water alone. A standard preparation for bowel purgation should be performed the day before the MR examination. Approximately 45 minutes prior tothe MR scan, patients are to ingest 1000 to 1500 mL of a water-based solution, eg, one that contains 2.0% mannitol or sorbitol. Volumen (E-Z-EM, Westbury, NY), a commercially available sorbitol-containing product, generally provides good small bowel distension after oral administration. 17,20 The oral contrast should be administered at a steady rate over a 45-minute period. To allow for uniform small bowel filling, additional administration of substances enhancing gastric emptying (eg, metoclopramide) may be useful. Sufficient colonic distensioncan be achieved by an additional rectal enema consisting of 500 mL of warm tap water. Since the use of rigid rectal tubes is inconvenient and uncomfortable, a thin Foley catheter is preferable. Patients should be examined in the prone position, which has proven advantageous for bowel MRI. 21 A torso phased-array surface coil should be used for signal reception. It is important to ensure coverage of the entire abdomen and pelvis in the Z-axis, which can usually be obtained by choosing a field of view of 400 to 450 cm. After the collection of a localizer sequence, a 2-dimensional (2D) and/or 3D fastimaging with steady-state precession (FISP) sequence should be collected. Different vendor-specific names for these sequences have beenintroduced, including TrueFISP (Siemens Medical Solutions, Malvern, PA), Balanced Fast Field Echo (Philips Medical Systems, Bothell,WA) and FIESTA (GE Healthcare, Waukesha, WI). One of the main features of this sequence is its relative motion insensitivity, which might be particularly important in patients unable to perform an adequate breath-hold. Fast imaging with steady-state precession data should be collected without fat suppression, because it not only ensures good visualization of the bowel itself but also of the adjacent mesentery and retroperitoneum. Furthermore, single-shot T2-weighted (T2W) sequences with fat saturation should be acquired. This sequence is helpful to depict edema in or adjacent to the bowel wall. Finally, 3D gradient-refocused echo (GRE) T1-weighted (T1W) MRI should be performed in conjunction with the IV administration of paramagnetic contrast. Since these images are most prone to bowel motion artifacts, a spasmolytic agent (eg, glucagon) should be administered intravenously approximately 1 minute before data collection. After acquiring a first precontrast T1W 3D gradient-echo data set, paramagnetic contrast is administered (0.1 to 0.2 mmol/kg gadolinium) and the acquisition is repeated after a delay of 20 seconds (arterial phase), 70 seconds (portal-venous phase), and 120 seconds (delayed phase). Sequence parameters are listed in Table 1. All image sets should be transferred to a postprocessing workstation. The contrast-enhanced 3D T1W images are interpreted in a multi-planar reformation (MPR) mode. Thus, the radiologist can scroll through the data set in all 3 orthogonal planes. Numerous different imaging features can be found in patients with IBD. Fast imaging with steady-state precession may be especially helpful to assess bowel wall thickening, mesenteric lymph nodes and peri-intestinal stranding (Figure 2). Furthermore, the presence of fistulae can be easily depicted on these images (Figure3). Gadolinium-enhanced T1W imaging can help to detect IBD independent of its activity state and has a high sensitivity of almost 90% (Figure 4). However, the specificity of T1W imaging is only moderate. It is often difficult to differentiate active versuschronic in&#64258;ammation. While active disease shows increased contrast enhancement due to increased perfusion and vascularity, chronic in&#64258;ammatory lesions may also strongly enhance because of fibrotic changes. The latter observation is comparable to findings of late enhancement in infracted myocardial tissue. Hence, the evaluation of disease activity in patients with IBD is a challenging task. Assessment of disease activity is often a key diagnostic factor, as therapeutic options differ for active and chronic IBD. While activein&#64258;ammation is treated with systemic cortico steroids or other immunomodulator drugs, interventional or surgical therapeutic options aretypically chosen for chronic disease. 22-24 In the past, attempts to classify IBD activity were time-consuming depending on perfusion analyses of the bowel wall. However, T2W imaging with fat suppression may evolve as a reliable marker for the detection of active IBD. Edemain or adjacent to the bowel wall, indicating active in&#64258;ammation, can easily be appreciated on these images (Figure 5). It is a rapid technique and can be used as a stand-alone tool for determination of IBD activity. Overall, the most accurate diagnostic assessment of IBD is basedon the complementary evaluation of T2W sequences, gadolinium-enhanced T1W sequences and FISP imaging. Florie et al 28 evaluated a technique to assess in&#64258;ammation activity based on different perfusion characteristics in 48 patients with Crohn's disease. AT1W GRE sequence through the abdomen was acquired with an image update every 6 seconds after IV administration of gadolinium. Different parameters (including the slope of enhancement, enhancement ratio, and enhancement time) were correlated with clinically based disease activity indices. These perfusion characteristics were found to be only moderately accurate indicators to determine in&#64258;ammatory activity. In addition, a rather long postprocessing time for the perfusion analysis was required. Ajaj et al 29 proposed an MRI-based scoring system to measure in&#64258;ammatory activity. Changes in the bowel wall were documented and quantified according to different criteria,including bowel wall thickness, bowel wall contrast enhancement, and the presence of adjacent lymph nodes. In their study, >90% of bowel segments with IBD changes were correctly diagnosed and categorized as mildly, moderately, or severely in&#64258;amed. Although the method showed high accuracy characterizing the activity of IBD, this technique was fairly cumbersome, since several different parameters had to be analyzed. Maccioni et al 30 performed a combined analysis of T2W imaging with fat saturation and contrast enhancement after the IV administration of gadolinium. The T2 signal of the bowel wall and mesentery was found to correlate especially well with the degree of in&#64258;ammation activity. There are also some drawbacks inherent to the MRI-based evaluation of IBD. Schreyer et al 31 reported that MRI provided only moderate accuracy for the depiction of subtle in&#64258;ammatory bowel disease. Mild mucosal in&#64258;ammation detected by (capsule) endoscopy may be missed by MRI. On the other hand, endoscopic studies may reveal healed mucosal lesions and fail to recognize deeper mural and transmural disease. These observations have been confirmed in a study that compared capsule endoscopy with MRI for Crohn's disease. 32 In this study, 27 patient swith Crohn's disease were studied by MRI and capsule endoscopy. 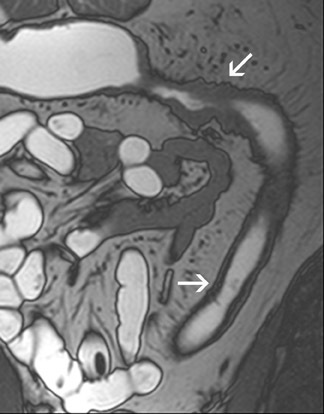 While the latter modality was slightly more sensitive to show mucosal lesions, MRI was superior to determine intramural involvement and extraintestinal complications such as fistulae. Thus, capsule endoscopy and MRI were considered as complimentary tools. However, prior to the performance of capsule endoscopy, an absence of bowel strictures needs to be confirmed. Since this can easily be done by cross-sectional imaging, MRI should be the first-line modality in patients with known or suspected IBD. MRI is an accurate, noninvasive, and easy-to-perform imaging tool for the assessment of IBD. Sufficient bowel distension is one prerequisite for reliable assessment of the bowel wall and can be achieved by different oral contrast agents and a rectal water enema. For the assessment of IBD activity, different approaches have been validated. The use of T2W imaging with fat saturation is most valuable for grading in&#64258;ammation and should be embedded in a comprehensive MRI protocol. 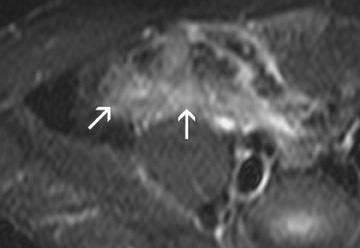 In patients with negative MRI findings who are at high clinical suspicion for active disease, endoscopic studies should be performed because of their higher accuracy for the depiction of mucosallesions. Gore RM, Balthazar EJ, Ghahremani GG, Miller FH. CT features of ulcerative colitis and Crohn's disease. AJR Am J Roentgenol. 1996;167:3-15. Comment in: AJR Am J Roentgenol . 1997;169: 1462-1463. Mary JY, Modigliani R. Development and validation of an endoscopic index of the severity for Crohn's disease: A prospective multicentre study. Groupe d'EtudesThérapeutiques des Affections In&#64258;ammatoires du Tube Digestif (GETAID). Gut. 1989;30:983-989. Miao YM, Koh DM, Amin Z, et al. Ultrasound and magnetic resonance imaging assessment of active bowel segments in Crohn's disease. Clin Radiol . 2002;57:913-918. Erber WF, Erber JA. Meta-analysis of the yield of capsule endoscopy in patients with Crohn's disease. Am J Gastroenterol. 2006;101:2669. Comment on: Am J Gastroenterol .2006;101:954-964; Am J Gastroenterol . 2006;101:965-966. Mako EK, Mester AR, Tarjan Z, et al. Enteroclysis and spiral CT examination in diagnosis and evaluation of small bowel Crohn's disease. Eur J Radiol. 2000;35:168-175. Booya F, Fletcher JG, Huprich JE, et al. Active Crohn disease: CT findings and interobserver agreement for enteric phase CT enterography. Radiology . 2006;241:787-795. Martin DR, Semelka RC. Health effects of ionising radiation from diagnostic CT. Lancet. 2006;367:1712-1714. Erratum in: Lancet . 2006;368:1494. Comment in: Lancet . 2006;368:365-656. National Academy of Sciences. Biological effects of ionizing radiation (BEIR) VII . Washington DC: National Academies Press; 2005.
van Gelder RE, Venema HW, Florie J, et al. CT colonography: Feasibility of substantial dose reduction--Comparison of medium to very low doses in identical patients. Radiology .2004;232:611-620. Prince MR, Arnoldus C, Frisoli JK. Nephrotoxicity of high-dose gadolinium compared with iodinated contrast. J Magn Reson Imaging. 1996;6:162-166. Luboldt W, Bauerfeind P, Wildermuth S, Debatin JF. Contrast optimization for assessment of the colonic wall and lumen in MR colonography. J Magn Reson Imaging .1999;9:745-750. Umschaden HW, Szolar D, Gasser J, et al. Small bowel disease: Comparison of MR enteroclysis images with conventional enteroclysis and surgical findings. Radiology. 2000;215:717-725. Comment in: Radiology . 2000;215:639-641. Gourtsoyiannis N, Papanikolaou N, Grammatikakis J, Prassopoulos P. MR enteroclysis: Technical considerations and clinical applications. Eur Radiol . 2002;12:2651-2658. Sood RR, Joubert I, Franklin H, et al. Small bowel MRI: Comparison of a polyethylene glycol preparation and water as oral contrast media. J Magn Reson Imaging .2002;15:401-408. Lomas DJ, Graves MJ. 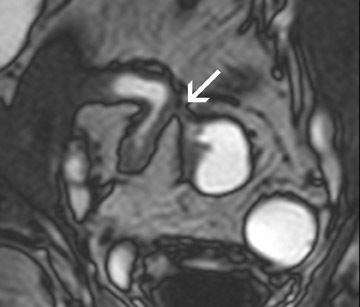 Small bowel MRI using water as a contrast medium. Br J Radiol. 1999;72: 994-997. Lauenstein TC, Schneemann H, Vogt FM, et al. Optimization of oral contrast agents for MR imaging of the small bowel. Radiology. 2003;228:279-283. Kuehle CA, Ajaj W, Ladd SC, et al. Hydro-MRI of the small bowel: Effect of contrast volume, timing of contrast administration, and data acquisition on bowel distention. AJR Am J Roentgenol . 2006; 187:W375-W385. Patak MA, Froehlich JM, von Weymarn C, et al. Non-invasive distension of the small bowel for magnetic-resonance imaging. Lancet. 2001;358:987-988. Rottgen R, Herzog H, Bogen P, et al. MR colon oscopy at 3.0 T: Comparison with 1.5 T in vivo and a colon model. Clin Imaging . 2006;30:248-253. Megibow AJ, Babb JS, Hecht EM, et al. Evaluation of bowel distention and bowel wall appearance by using neutral oral contrast agent for multi-detector row CT. Radiology. 2006;238:87-95. Erratum in: Radiology . 2006;241:948. Comment in: Radiology . 2006;241:947; author reply 947. Papanikolaou N, Prassopoulos P, Grammatikakis I,etal.Technicalchallenges and clinical applications of magnetic resonance enteroclysis. Top Magn Reson Imaging. 2002;13:397-408. Yang YX, Lichtenstein GR. Corticosteroids in Crohn's disease. Am J Gastroenterol. 2002;97: 803-823. Vermeire S, van Assche G, Rutgeerts P. Review article: Altering the natural history of Crohn's disease--Evidence for and against current therapies. Aliment Pharmacol Ther .2007;25:3-12. Rutgeerts P, Diamond RH, Bala M, et al. Scheduled maintenance treatment with in&#64258;iximab is superior to episodic treatment for the healing of mucosal ulceration associated withCrohn's disease. Gastro intest Endosc . 2006;63:433-442; quiz464. Comment in: Gastrointest Endosc . 2006;63:443-444. Nahon S, Bouhnik Y, Lavergne-Slove A, et al. Colonoscopy accurately predicts the anatomical severity of colonic Crohn's disease attacks: Correlation with findings fromcolectomy specimens. Am J Gastroenterol . 2002;97:3102-3107. Kettritz U, Isaacs K, Warshauer DM, Semelka RC. Crohn's disease. Pilot study comparing MRI of the abdomen with clinical evaluation. J Clin Gastro enterol . 1995;3:249-253. Koh DM, Miao Y, Chinn RJ, et al. MR imaging evaluation of the activity of Crohn's disease. AJR Am J Roentgenol . 2001;177:1325-1332. Florie J, Wasser MN, Arts-Cieslik K, et al. 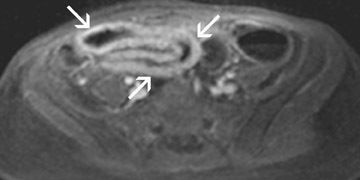 Dynamic contrast-enhanced MRI of the bowel wall for assessment of disease activity in Crohn's disease. AJR Am J Roentgenol. 2006;186:1384-1392. Ajaj WM, Lauenstein TC, Pelster G, et al. Magnetic resonance colonography for the detection of in&#64258;ammatory diseases of the large bowel: Quantifying the in&#64258;ammatory activity. Gut . 2005;54:257-263. Comment in: Gut . 2005;54:181-182. Maccioni F, Bruni A, Viscido A, et al. MR imaging in patients with Crohn disease: Value of T2- versus T1-weighted gadolinium-enhanced MR sequences with use of an oralsuperparamagnetic contrast agent. Radiology . 2006;238:517-530. Schreyer AG, Rath HC, Kikinis R, et al. Comparison of magnetic resonance imaging colonography with conventional colonoscopy for the assessment of intestinal in&#64258;ammation in patients with in&#64258;ammatory bowel disease: A feasibility study. Gut . 2005;54:250-256. Comment in: Gut . 2005;54:181-182. Albert JG, Martiny F, Krummenerl A, et al. Diagnosis of small bowel Crohn's disease: A pro-spective comparison of capsule endoscopy with magnetic resonance imagingand &#64258;uoroscopic enteroclysis. Gut . 2005;54:1721-1727. Comment in: Gut . 2006;55:903. 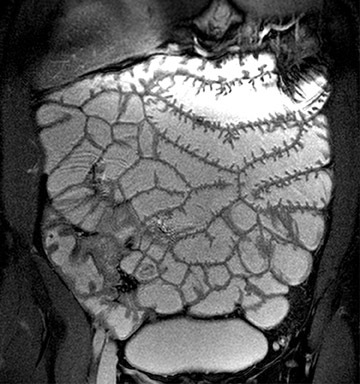 MRI of inflammatory bowel disease. Appl Radiol.